Yay! Malaysia is celebrating 51 glorious years of Independence on 31th August this year. It's a proud day for us Malaysians and I am so proud to be a Malaysian!!!! Anyway, Rozella (Thanks dear) tagged me for this Merdeka Meme and I'd like to tag Molly, Lianny, Nightwing, Foong, and Linda. Have fun! 1. mangosteenskin - Saya anak Malaysia! 2. Life is too short to be ordinary - Malaysia Tanahair Ku! 3. Sha's Love & Passion - Aku Anak Merdeka 4. A room of crazy scrapper - Merdeka!Merdeka! Merdeka? 5. Fliffy - Aku Patriotik, Sayang Malaysia ! 6. Rizal 7. haniz - Merdeka Forever! 8. Prozak Nation 9. CarolPinky - Proud Malaysian! 10. Mariuca - I heart Malaysia! 11. Emila’s Illustrated Blog - Saya Anak Malaysia juga 12. Simple Life - Sam - Saya Anak Malaysia 13. Shemah's My Sweet Escape - Live, Enjoy and Love.. MALAYSIA! 14. Mariuca's Perfume Gallery - Made in Malaysia! 15. Yani-Tennitodoku-Proud to be a Malaysian-MERDEKA! 16.Bluecrystaldude from My Little Black Pot - Saya Harap Malaysia Terus Maju! 17. Apples of the eyes 18. Snapshotcap - Freedom of choice is made for you my friend :) 19. Anaheus 20.Confessions Of A Breathing Tote Bag 21. A Great Pleasure - Malaysia is a food paradise ~ simply yummy~licious! 22. Mummy HnH - Harith and Hannah - MERDEKA 51st Celebration!!! 23. Shafie - I'm Here For U Malaysia 24. Nessa - Happy 51st Merdeka, Malaysia! 25. marvic 26. Deasya 27. Asian Mutt International 28. Point Blank - Sokonglah Pelancongan Domestik, Malaysia Cantik Indah Nian! 29. Turn-u-Off 30. you're next! I hv an award for you gal..Drop by my site to check out..:) Hv a great weekend. happy independence day! hope you have a wonderful weekend dear. Hi Monica, day after you celebrating Merdeka day either watching on TV, taking part in a parade or having a party. I feel so jurassic each Merdeka day as I was there, as a young schoolboy taking part in Malaya's 1st school mass drill by several thousands students. (Posted about it in my archives). And I was there in Merdeka stadium when the British Union Jack was lowered and same time the new Malayan flag rose up slowly. And then the police band played Malaya's 1st National anthem, 'Negara Ku'. Taken from the song, 'Terang Bulan'. Yes, even though I was young then, I felt emotional together with the 40,000 people in the stadium. Then we all joined Tunku Abdul Rahman in crying out, "MERDEKA"! 7 times....gosh, I think the roar of the jubilant crowd crying out 'MERDEKA' 7 times could be heard far away too. 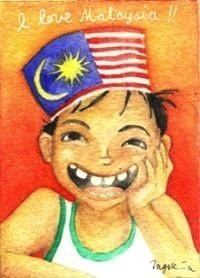 Happy Merdeka day to you and your readers. By the way, sorry I took out the new posting about Rose, but I guess it might be sensitive to some. Anyway, will be bringing out another one, less, ha ha sensitive later. You stay beautiful, Monica and don't get sunburnt, Lee. hi monica! i have tagged you and i hope you don't mind..
You have a good Merdeka break...cheers. Thanks for doing it so quick dear! :) Hope you're having a fun weekend!